At last after a windy spring we have summer here in the Marlborough Sounds! Compass Charters Crew wanted you to know what we are up to for this season and we would like to introduce a couple of new launches and welcome back an old favourite to the fleet, along with a few crew additions and new excursions. We are proud to announce two new additions to a fleet of Launches. The first is a 42ft Formula 4000 called “ Indulgence ”. Compass Charters has had tremendous success with this design in the past and is excited to be able to offer the design again for bareboat and skippered charter. She is undergoing a full MSA survey at present along with major upgrades of systems and will be available for charter from Mid December onwards. Indulgence, as its name implies, is a stylish launch aimed to cater for a family or a group of friends, intending to cruise and explore the beauty, the Sounds has to offer. She has all the comforts of home plus more to offer the discerning mariner. All details and specs on Indulgence are available on our fleet page. We also have a smaller 27ft Markline 800 called “ Chi ” has also joined the fleet and will be available for charter Mid December. Chi has a 200hp Volvo and can sleep 3 with room for 5 friends for day trips. A great little launch for a couple to explore the Sounds this summer or a group of mates out for the day for a spot of sightseeing and fishing. She can get you to where you want to be in no time at all so you can enjoy your spot a little longer. Check her out on our fleet page. Most of our Launches are heavily booked for the season but with these additions to the fleet this will help avoid some disappointment. Robin and Charleigh have joined the Compass Crew and are no strangers to the water and have settled in extremely well over the last few weeks. 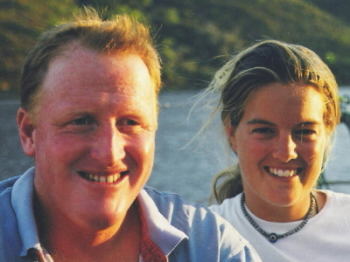 Robin and his wife have owned several yachts and powerboats and have moved up from North Otago. Robin is responsible for the fleet maintenance and with a background as a qualified mechanic, a love for boats and the water, this will prove to be a welcome mix. Charleigh and her husband have moved here after serving 5 years in the British Royal Navy. Charleigh’s position in the Navy was as Steward so she will have all your boats ship shape and in Bristol fashion! She is learning the ropes (literally), as our vessels are a fraction smaller than the ones she is used to!! Louise and Aaron have settled in well and they love the area. It has been a very busy time with a popular spring season with charters, very strong wind and conditions, and more than half the fleet out of the water at one time or another to get their hulls cleaned, polished and painted ready for the upcoming season. Aaron and Louise have moved to Marlborough from the Coromandel. They have extensive experience in the charter world, hospitality industry and vessel management. 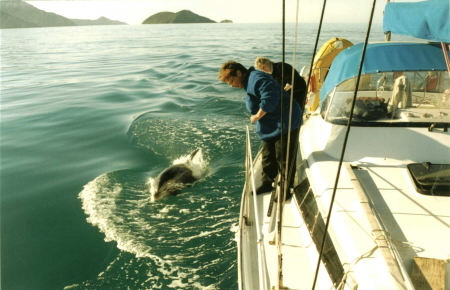 They have relished in the new challenge and will provide you with professional and personal service to make sure you have unforgettable charter experiences on and around the waterways of the Marlborough Sounds. They intend to extend the charter fleet and the diversity of the boating holidays. Contact us to see how we can make your holiday this season on the water a great one. Let us know what you would like and the Compass Crew will make it happen. If you are chartering off us this season then we have a fully stocked shop with all the gear, tackle and bait you will need for your trip here in the Sounds. We have over 40 rods for hire and the shop has grown since last season and has all been updated with the latest stock. We specialise in fishing and diving trips for all group levels. For all you underwater enthusiasts, there will be scheduled dive trips on Topaz this season. A professionally guided two-day trip to Port Gore will give you the chance to explore the Mikhail Lermontov besides other interesting dive sites. The cost for this is $595 pp and this includes all your dive equipment and meals. (Conditions will apply). We can also sort out longer trips to D'Urville Island. Please give us a call or email if you are interested. Dive Marlborough has settled well into our building and they are even expanding taking over more space out the back. We have special rates we can give all Compass Charters crew so let us know in advance so we can get all your diving needs looked after and organised. A compressor is on site in our building and NITROX is available this season for the first time. We are proud to announce that we are providing Seal Swimming trips starting this season with a qualified and liscenced diver/guide. A fantastic experience snorkelling with and watching seals in their own enviroment playing. All wetsuits and snorkelling equipment is provided. The cost for this is $95 per person. Minimum group is 4 people but they dont all have to come from the one boat/yacht or launch you are on. You can book ahead in time and then we can arrange for the guide with fast RIB to meet you at your mooring and take you for your adventure. You should allow approximatly one hr for this adventure. If you are not on a boat with us then thats fine as well. Contact our ofice and you will set off from Waikawa Marina in the fast boat with your diver-guide. Charter News and developments If you have always wanted to give sailing a go or are a bit rusty then we have a few programs for the summer, which may appeal to you. It has been a busy spring and for summer and we plan to operate a 3-Day and 5-day Cruise and Learn programs right through till mid May. They will usually run from Monday to Friday with one of our professional skippers, but call us if you need some flexibility. Contact us for further details. If you prefer a shorter cruise with less or no emphasis on sailing tuition and skills spend 1 to 3 days with us in Queen Charlotte Sound. It's a wonderful way to spend a weekend. We aslo have a skipper who specialises in nature cruises for groups of up to 6. We have several enquiries from single sailors who want to team up with a crew of other single sailors. We will provide the skipper and will put together a crew for you. Please enquire for further details on a great holiday in this area . Prices 3 Days $650, 5 Days $990, Discounts 10% off for each: 90 day advance booking; 2 or more persons. Minimum of 4 people required per trip. If you want to cruise in comfort and style then we are running daily skippered charters aboard Panache Cat this season. For a great day out on Queen Charlotte Sound taking in all the sights, this luxurious vessel sets a fast and stable pace on the water. We can take up to groups of 24 or less. Perfect for corporate events and team building, sheet in that sail, hoist the main, take the helm to feel that exhilarating feeling of gliding past the islands – Panache Cat will be the highlight of your trip here in the Sounds. Picnic lunch and refreshments included. Prices Daily rate per person. $195.00 includes picnic lunch and soft beverages. Discounts 10% off for each 60 day advance booking with 4 or more persons in one party. Minimum of 8 people required per trip aboard Panache Cat. Qualified Skipper is included in price. "Treat yourself to the finer end of life - you deserve it!" We all hope you are looking forward to a great summer on the water! Seas the day! – from the crew at Compass Charters. This is all the news we have for you at the moment but we hope to be back with more soon.